Henderson invested as NSU’s 18th president. NATCHITOCHES – Dr. James Braswell Henderson was installed to the office of the President of Northwestern State University of Louisiana Friday during a day of ceremony, nostalgia and celebration. Henderson, his wife Tonia and their children were honored throughout the day by dignitaries, academic officials, political figures, prominent clergy, friends and representatives from other institutions as students, faculty, university staff and the community gathered for the formal ceremony, the first Northwestern State has hosted in 18 years. The proceedings were steeped in tradition as a procession of Northwestern State faculty in full academic regalia, accompanied by the NSU Wind Symphony, began the investiture in A.A. Fredericks Auditorium, attended by students, staff, alumni and friends. Garrett Pierce, Student Government Association president; Faculty Senate President Dr. Massimo Bezoari, Joseph B. Stamey, president of the Alumni Association, and Natchitoches Mayor Lee Posey offered welcome. In his Investiture address, Henderson acknowledged his family, his wife Tonia, daughter Reagan and sons Nicholas and Alexander, his mother, Dr. Martha Henderson, and the recent loss of his father, the late Clement Henderson Sr., who died March 9. “This would have made him proud, and everything in my spiritual and religious being assures me that a part of him is with us today,” he said. 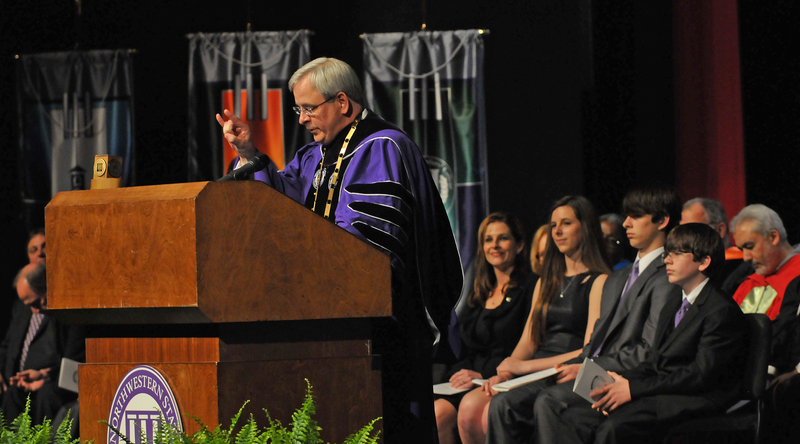 Henderson dedicated the Investiture to the Northwestern State students. Henderson said that hundreds of faculty, staff and students have been involved in the shaping of his vision for the university. “Northwestern State University will become the nation’s premier regional university through innovative, transformative student learning that prepares graduates for life and career success,” he said. The Investiture is about more than the presidency, Henderson said. Media executive Gregory Ashlock, a 1991 graduate of Northwestern State, was guest speaker. Ashlock is executive vice president of operations iHeartMedia USA and president of iHeartMedia Southern California. He spoke of the commitment required to effect positive change. Henderson, Ashlock said, represents change, progress and the augmentation of the accomplishments of those before him. Ashlock enumerated seven aspects related to change: a sense of urgency, advocacy groups, creating a vision, communicating the vision, empowering others, setting realistic goals and finishing the job. Ashlock offered a quote from Albert Einstein, “The world we have created is a product of our thinking; it cannot be changed without changing our thinking,” in relation to change at Northwestern State. Dr. Sandra K. Woodley, president of the University of Louisiana System, of which NSU is a member, issued the presidential commission. Henderson was robed by Pierce with assistance from Woodley and Jimmy Long, a member of the Board of Supervisors for the University of Louisiana System, in regalia that is a gift to the president from the student body. The robes, in school colors of purple and white velvet, were designed by the Student Government Association and represent the mutual collaboration between the students and the administration. Woodley and Long presented Henderson with the President’s Chain, which bears the university seal and links engraved with the names of all Northwestern State presidents and the years they served. The chain was a gift to the president in from the Student Government Association to commemorate the university’s 125th anniversary in 2009. The Northwestern State Chamber Choir, singing from the auditorium balcony, performed an Investiture Anthem during the ceremony and the Northwestern State alma mater at the close, accompanied by the Wind Symphony. The day began with an Investiture Mass of Thanksgiving at the Minor Basilica of the Immaculate Conception in Natchitoches, concelebrated by both the dioceses of Alexandria and Shreveport. The Principal Celebrant was the Most Rev. Michael G. Duca, Bishop of Shreveport. Msgr. Earl Provenza, pastor of the Hendersons’ home parish, Holy Trinity Catholic Church in Shreveport, delivered the Homily. Other celebrants and readers included the Rev. Ryan Humphries, rector of the Minor Basilica, and visiting priests from both dioceses including three who are Northwestern State alumni and for whom Immaculate Conception is their home parish. The Northwestern State Chamber Choir was featured in vocal selections chosen for especially for the Mass. The Investiture Mass marked the first occasion that the university has been prominently included in a Mass celebrated concurrently by both dioceses, which until the 1980s were part of the one Diocese of Alexandria/Shreveport. Prior to 1910, both were part of the Diocese of Natchitoches, whose See was the Minor Basilica. The Most Rev. Ronald P. Herzog, Bishop of Alexandria, who was scheduled as principal celebrant but unable to attend due to health reasons, granted a dispensation to Catholics attending the Investiture celebration from the Lenten obligation of abstaining from meat. Late morning classes were cancelled and campus offices were closed for the event so that all faculty, staff and students could attend. Following the campus ceremony, the Hendersons opened the Arnold R. Kilpatrick President’s Residence for a community reception in which guests congratulated the new first family. Henderson and his wife, the former Tonia Istre, are both graduates of Northwestern State. Henderson earned his undergraduate degree in journalism at NSU in 1994, his master’s in administration from the University of West Florida and a Doctor of Management from the University of Maryland-University College. Mrs. Henderson earned a degree in journalism at NSU in 1993. Prior to his appointment at NSU, Henderson was chancellor at Bossier Parish Community College for five years, where he oversaw enrollment growth of more than 84 percent and increased annual certificate and degree completions by 90 percent. Henderson was named Northwestern State president last September and took office on Jan. 1. He built an immediate rapport with students through social media, personal accessibility and his presence at campus functions. Throughout the Investiture, students and others commented on the proceedings via Twitter postings @DrJBHenderson #newprez and on Facebook. Friday’s Investiture was well-received by students who respond to Henderson’s personable nature. ← Natchitoches Parish 4-H needs our help.